It's a super home fit for a supermodel! 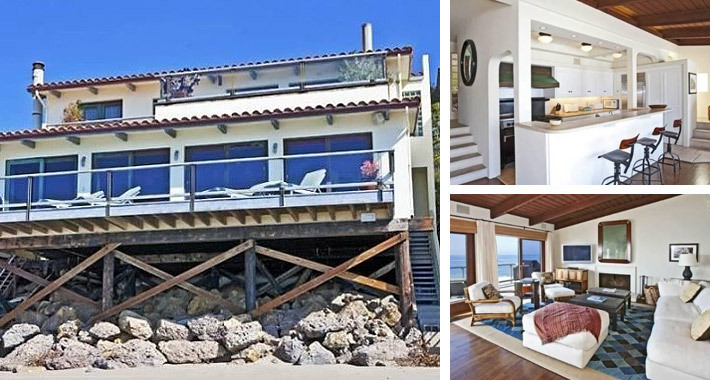 Cindy Crawford's Malibu beach house has been listed for rent for a whopping $19,500 a month! The Revlon spokesperson and husband Randy Gerber purchased the abode back in April 1998 for $1.85 million. Located off Pacific Coast Highway just north of famed Broad Beach, the "private and serene" property is 2,413 square-feet and boasts 3 bedrooms and 3 bathrooms, in addition to an office which can be used as a fourth bedroom. Design details of the pad include an open floor plan, beamed ceilings, dark hardwood floors throughout, and an amazing sun deck that leads to direct beach access. The spectacular ocean views from every room are to die for! The catwalker and her hubby Randy Gerber won't be without a roof over their heads, though, because they own another piece of real estate just up the road.